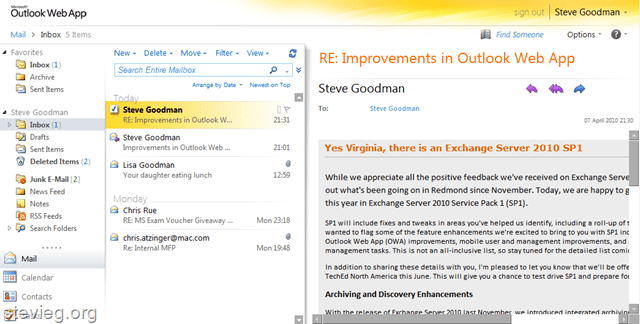 Today Microsoft made public some of the new features in Exchange 2010 SP1 over on the Exchange Team blog. There’s a multitude of new features available and I encourage you to take a look. I’ll be publishing a few posts over the coming days on features I’m most interested in but to start off, I’m looking at the massive improvements to Outlook Web App. One of the biggest improvements in Exchange 2010 was the cross-browser OWA compatibility and cleaner interface. In the past, this would have been it until Exchange 15 came out, giving the competition (i.e. Google) a few years to catch up and leapfrog Microsoft. Today Microsoft made it clear that no longer will they allow the competition to out-innovate them against Exchange, and they will continue to deliver benefits to customers in between major releases. What’s new in the premium interface? Enough anyway with the talk. Let’s get down to business and have a look. As you’ll see the interface is a whole lot cleaner. There’s a breadcrumb navigation trail in the top left, just below the OWA logo to help you find where you are at a glance. The Exchange icon has gone – It’s just a simple tree menu. The structured lines separating the elements fade away and blend into the background. The icons have been refreshed and only what’s needed is present. If you look very closely you’ll even see that you can use checkboxes to select email. You don’t need to ctrl-click anymore, unless of course you want to! The interface overhaul isn’t all that’s new. Also announced today were the following new features for OWA SP1 – A new set of themes, sharing calendars to the web and allowing the reading pane to be shown across the bottom. I’ll be following up Calendar sharing in more detail in my next post in a couple of days time – as it requires a little server configuration, and there’s more to show off. Hope you’ve found this interesting. If there’s some more Exchange 2010 SP1 features made public over at the Exchange Team Blog that you’d like more information about let me know. If I can tell you, I will. ← A big thanks to Chris Rue! Nicely Done on the Blog 🙂 Need a iPhone 5 ? Email me at eiguy31@gmail.com I have stumbled upon this site by accident! I do like the manner in with you have presented this matter. I am used to managing my Inbox through .pst datafiles. We are moving to Outlook Web Ap Premium 2010. Can I drag and drop my messages onto my hard drive so that they are searchable with Google Desktop? No, you need to have Outlook installed for that, unless Google made a connector to search OWA that I’m not aware of. The search facilities in OWA have improved a lot over previous versions, including searching within Office document attachments and similar, so you might not need it. How do you get the “RSS feeds” element to show up in the OWA interface? 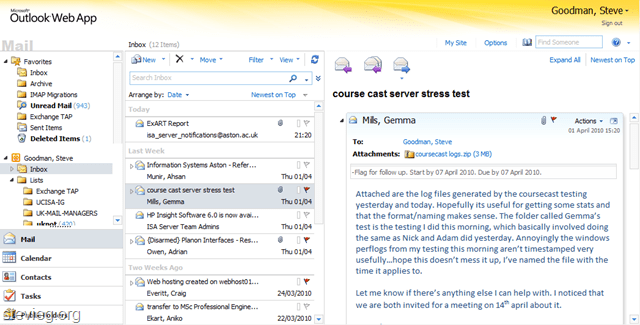 I think it has to be added by the desktop version of Outlook 2007/2010, then it shows up. you’re really a good webmaster. The web site loading speed is incredible. It seems that you are doing any unique trick. Also, The contents are masterpiece. you’ve done a fantastic job on this topic! I am trying to print only the emailed document. How do I collapse everything to the left of the document so only the document is printing. When I print it shows everything I’m looking at and 1/2 document is cut off. The themes are great looking this time around. Glad to see MS getting their creative juices cooking! Thank you for the post. Definitely like the calendar view but looking at Google’s ui, it’s definitely missing a search box. Is it out of frame? Also, any chance of ow taking advantage of html5 offline storage? Yes you’re right – it could do with search. Of course Google Calendars got it, and so has Outlook 2010. I wonder why it’s not been added to OWA? It’s awkward, but if you switch back to the mail view and use the search box there, the results include calendar entries.